As the holidays draw closer, and we make plans with those dearest to us, it can be a stressful time. We often get caught up in the “busyness” of wrapping things up at work before taking time off. We get bogged down by the stress of travel and traffic, not to mention coordinating schedules, long to do lists, and keeping everyone involved happy. But the truth is, the holidays aren’t meant to bring stress. They are meant to be a time of reflection and gratitude. The Thanksgiving season, in particular, is a great time to implement habits that can have a long-lasting impact not only on your personal life but also on your work life. Keep a highlights or a gratitude journal. Keep a small journal on your bedside table with a pen. Each night before turning off the lights take a moment to reflect on the day and list a few highlights from your day or things you’re grateful for. This should be no more than one or two sentences. Keeping it short will make it easier to accomplish and feel like less of a burden. Go out of your way to say ‘thanks’ to someone at least once a week. 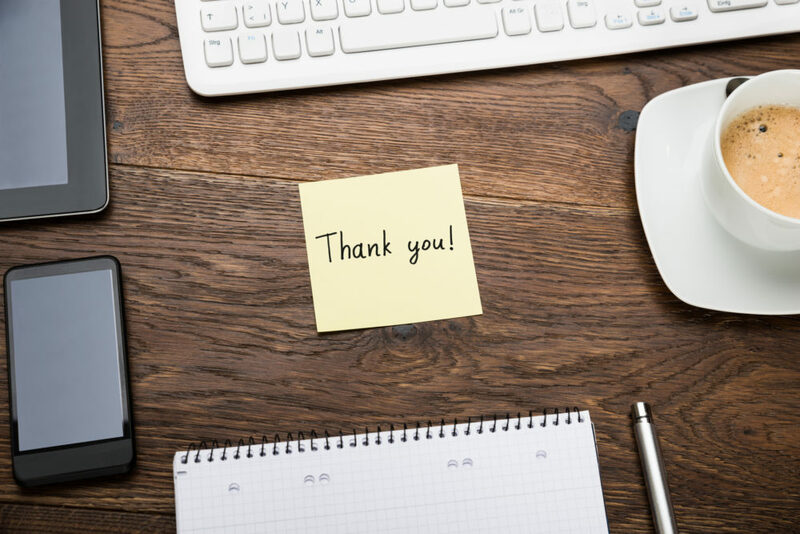 Whether it’s dropping by a colleague’s office, giving a ‘shout out’ in staff meeting, or sending a quick email, taking the time to recognize a co-worker can put both you and the recipient of your gratitude in a better mood. It can also build long-lasting rapport and increase morale on your team. And if you are in a position of leadership this is even more important. In fact, a study by Glassdoor revealed that four out of five employees report they are motivated to work harder when their boss shows appreciation for their work. Be mindful about the good, the bad, the big, and the small. A gratitude practice does not need to be focused on only the “highlights” of life nor does it only need to be focused on the “big” things in life. Consider some of the challenges you experience. What are you grateful for about those challenges? How have they shaped your character? Taught you life lessons? In an article in the Huffington Post, Western Buddhist master Jack Kornfield shared an exercise he did with a man who was charged with caring for his grandson while his son and daughter-in-law battled drug addiction. Even through the challenging circumstances, the man expressed gratitude for the compassion he had learned to show and the impact he was able to have on other people. Make an annual celebration out of gratitude. The period between Halloween and New Years Day is a wonderful time to build an intentional gratitude practice. The roughly eight-week period could be a time where you and your family share one thing you are grateful for each night at the dinner table or perhaps you share something you’re grateful for each day on social media or you could do a photo-a-day project where you take a picture of something you’re grateful for and create your own personal gratitude photo album. Make a ‘gratitude’ goal of implementing one of these habits and reflect on how it transforms your thinking throughout the day. Being aware of the things in life that you are grateful for does not need to be reserved for special holidays or season. But this season of Thanksgiving is a great time to kickstart a gratitude practice that you can maintain all year long. There’s no downside to taking stock of what you are thankful for, so take five minutes a day for mindfulness and watch how it transforms not only your work day but your life.